EDEN PRAIRIE, Minn. - March 13, 2019 - PRLog -- As the booming Minnesota software as a service company, Dealer Teamwork, continues with its rapid growth, they have brought an elite software development executive on board as Chief Information Officer (CIO). 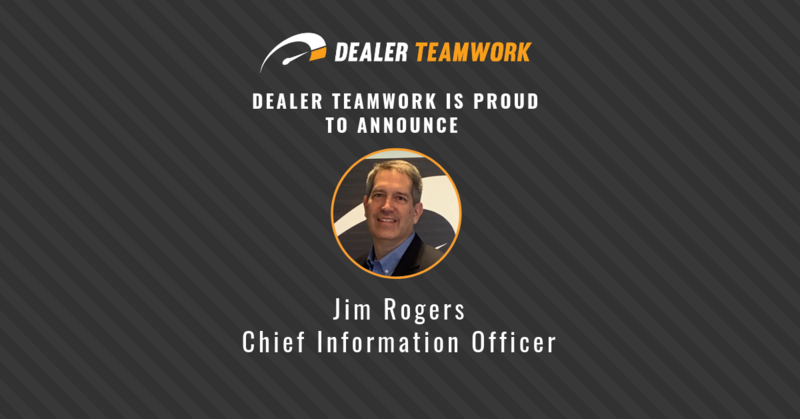 The entire Dealer Teamwork organization welcomed Jim Rogers to the team in February 2019, including the CEO and Co-founder, Sean Stapleton, who said, "We are so lucky and blessed to have such an amazing, experienced leader join our Dealer Teamwork family! Jim is not only a class act, but his successful track record, knowledge and experience immediately made our company better." Rogers comes to Dealer Teamwork after working in the development of enterprise software products for over twenty-five years. Most recently, he worked for Oracle Corporation as Vice President of Software Development overseeing the development of Oracle's Business Intelligence products. He came to Oracle through its acquisition of Siebel Systems in 2006, where he led software engineering for Siebel Analytics. When asked about his decision to join Dealer Teamwork, Rogers stated, "I am thrilled to have the opportunity to join the great team that created the MPOP®, and I look forward to helping Dealer Teamwork and its parent company Digital Teamwork enhance and expand this incredibly innovative digital marketing platform." With Rogers on their team, Dealer Teamwork is stepping up to a new level of professionalism, speed-to-market and excellence with their technology stack. Stapleton further stated, "With Jim's successful track record scaling companies for success, we are set up for an even more profitable 2019. Experience matters, because leaders are made, not born. This is an incredible addition to the fantastic leadership team already assembled! We just landed one of the most successful CIOs in the country – period!" Dealer Teamwork is one of the fastest growing SaaS companies creating first-class solutions for the retail automotive industry. Dealer Teamwork created the automotive industry's first MPOP®, a patented Merchandising, Personalization & Optimization Platform. The platform creates a significant competitive advantage for dealers by distributing their transactional data to more in-market shoppers effectively and efficiently. For more information please visit https://www.dealerteamwork.com/. Dealer Teamwork's headquarters is in Eden Prairie, Minnesota, and services an international customer base from offices in California, Colorado, Florida, Massachusetts, Nevada, New York and Texas.